Happy holidays! 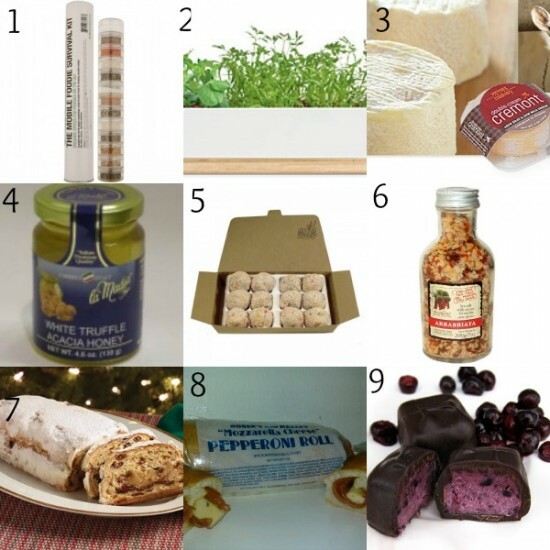 Welcome to Grace(full) Plate’s 3rd annual foodie gift guide! The guide is broken down by: In The Kitchen, Edibles and Colorado Local. You’ll note the choices in Edibles are largely all focused on artisan mom and pop shops. Please note the photos of the items are chronologically arranged, in the order they were listed. The majority of the items are available to anyone as they can be found online. In some cases, I picked the best price with the online store for easy purchasing but it doesn’t mean it’s the sole provider of the product. I also focused on making them affordable and largely under the $150 price mark. My hope is that you find something new you can’t cook without, you support local and this helps your shopping this season for the foodie in your life. 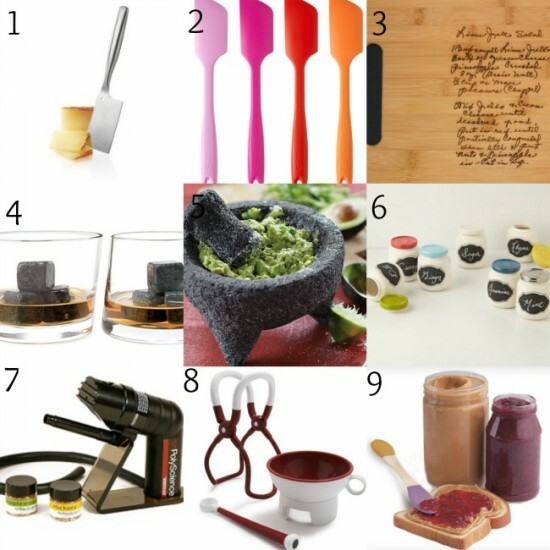 As they may still be relevant, you can find the last two years’ foodie gift guides here. I was given this stainless steel mini cheese “hatchet” as a gift. I love laying it out for my cheese plates for harder cheese and the stainless steel gives it a high quality and durability from Holland. GIR stands for “get it right” and their first focus is on the spatula while applying intelligent design to everyday products and experiences. The spatula is available in an array of bright colors (I own the red) and the silicon provides heft and high-heat thresholds. This is a beautiful handmade bamboo cutting board that are made to order. You can send in a handwritten recipe from a loved one, and it will scan directly onto the board in their handwriting. Whimsical and nostalgic. Great price too! For the cocktail lover in your life, these soapstone cubes allows you to chill your preferred spirit, without diluting them. The softness of the soapstone doesn’t scratch the glass and retains the temperature for extended period of time. This piece is one of my favorite party items because of its unique beauty. They’re hand carved from volcanic rock so no two are alike. It’s great for crushing whole spices, serving guacamole and/or use as a serving bowl. These small spice jars come with a blank chalkboard on front so you can hand-write what’s inside. Great for loose leaf tea, spices or even candy. Available in five colors. Perhaps for the more advanced cook in your life, the smoking gun is the alternative to traditional smoking methods. It adds flavor to a variety of foods just by adding a measured amount of natural, cook smoke. With a funnel, jar lifter and lid lifter these simple tools become your sidekick in the canning process to make things a little easier. The lid lifter is magnetic and lids come up from the hot simmering water without hand contact! If you’re a purist, you might have to use two different knives; one for peanut butter and the other for jelly. This inventive spreader is double sided and even more conducive to spreading than a knife. Fun looking too! This is a travel sized tube with 13 organic herbs and spices that are essential for any “foodie on the go”. Herbs include ginger, basil, cayenne and more. The tubes are fully recyclable and are made of post-consumer recycled paperboard. This recycled steel box comes with crops of seeds and directions for harvesting your mini-field which is perfect aesthetically as a windowsill planter. The veggie kit comes with red cabbage, mini-carrot greens and tom thumb pea greens. Fun for a family and learning. I went to college in Vermont and it’s a beautiful state. This soft cremont cheese is always on my cheese plates. It’s cow and goat milk, included with Vermont cream. It’s luxurious, creamy and smooth. It goes great with fig on a crostini. Purchased when in Italy, I wish I bought it in multiples. It goes fast and is perfect drizzled on cheese or for glazing meats. It’s incredibly aromatic and well loved. Hailing from the infamous Momofuku Milk Bar, they’ve boxed up their rainbow cake crumble truffles, complete with sprinkles. It comes in a gift box of 12 truffles and ships right to you. Including sea salt, chili and pepper this Italian sea salt is perfect for seasoning or to be added while cooking. Product of Tuscany. A classic pastry from Germany, the loaf is filled with candied oranges, rum-soaked raisins, almonds and lemon peels. Delivered like a “log” it’s covered with confectioners’ sugar and is a wonderful holiday gift to share with friends. Pepperoni Rolls are an iconic food item found in West Virginia amongst the Italian miners that immigrated there (this includes my family). Pepperoni is baked around a warm roll and can’t be found in many other places, except Italian bakeries in West Virginia I grew up visiting. We found one bakery that delivers a half dozen via shipment. A warm, special savory treat. Based out of Oregon, Arrowhead Chocolates’ huckleberry truffles won the good food awards. These huckleberries are locally picked, infused with cream, with a hint of lemon zest and chocolate granache. This price comes with a box of 12. You can buy these in packages as great stocking stuffers. The chai nuts are a top seller, which have flavors of cardamom and vanilla. They’re a healthy snack, as well. This bloody mary mix is unlike any I’ve tried before. It’s thick, packed with citrus, carrot and peppers that make it just spicy enough. 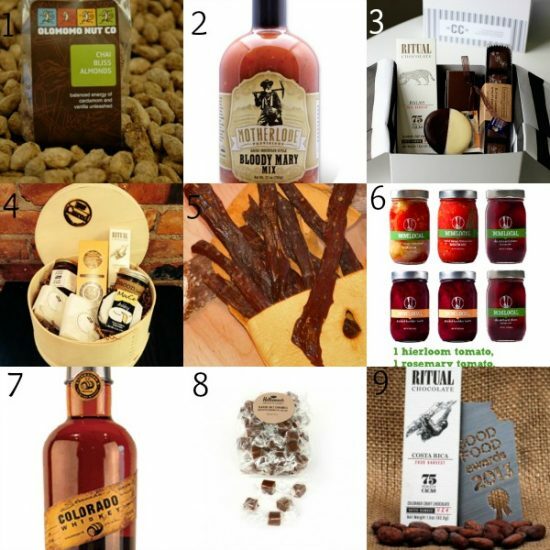 Colorado Crafted curates artisan food products, made only in Colorado into delightfully designed gift boxes. Dulcie and Sarah scour Colorado to find the best purveyors of food from chocolates, to sauces, to coffee to jerky. Shipping is free in the US! You can find a variety of boxes hand-selected at Cured like their Coloradan for $75 which includes cheese, crackers, preserves, chocolate and jam all made in Colorado. This Summit County company creates a variety of jerky that’s made from whole muscle, smoked and natural. You can find the likes of beef, elk, buffalo, pork, venison or even salmon jerky. Try the hickory smoked buffalo jerky for jut $8 for a 1.75oz bag. MM Local partners with local farmers to pick produce at the height of their ripeness, then they preserve the food into a variety of jarred goodness. We suggest the MM Local Classic Six-Pack this holiday season which includes a jar of heirloom tomatoes, two jars old orchard plums, two jars pickled Boulder beets and one jar tomato with rosemary for just $45. Stranahan’s is a small batch American whiskey made and only sold in Colorado. Independent and family-owned, it’s made with 100% malted barley and their distillery can be found in Denver. Hellimae’s was started by Ellen Daehnick in 2010, she creates small batch, hand-made caramels and some other fun items like banana pudding or pecan crunch. We personally love the classic salt caramels but you may also want to venture into her chili palmer caramel sauce that’s spoonable goodness. You can purchase the caramels online or through retailers now in 10 states! Ritual Chocolate creates single origin chocolate, using traditional European methods with their ethically-sourced cacao from around the world. They even hand wrap every chocolate bar. Try the Costa Rica bar for $6.75 made from organic cacao from the Guapiles region of Costa Rica. It’s a dark chocolate that’s bold, with hints of blackberry and walnut. May you have a wonderful holiday season! Enjoy! Thanks Meghan! Glad to hear you like it 🙂 I wanted to give people plenty of time for the holidays to plan and order! Thanks Shannan! 🙂 Hope you find something fun on here!